Ramingstein is a small community in the south-east of Salzburg, more specifically in the Lungau region. Like much of the Lungau, it has not been developed for major tourism as soon as some places in the neighbouring Pongau area have - which now turns out to be a real advantage, as much of the Lungau has preserved a great deal of rural charms. Ramingstein in particular is a great place for off-the-beaten-track hiking in Salzburg. The village′s most striking feature is the Burg Finstergrün, a romantic castle built in the 19th century on the foundations of a 13th century castle. 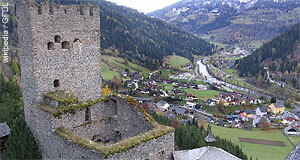 Ramingstein is the only community in all of the Lungau that can be found at an altitude that is below 1000 metres above sea level. During the winter season, Ramingstein makes a good base for skiing in the Nockberge region. Ramingstein can the tracked back into the Middle Ages. For centuries, the town prospered due to intensive silver and lead mining that took place here. In addition, Ramingstein was known for its marble quarries. In the nearby Mühlbachtal, iron ore mining was done. All these mining activities made Ramingstein one of the most important mining towns on the territory of modern Austria. However, this gradually ceased later and by the beginning of the 19th century, Ramingstein was already a sleepy village when a terrible fire finished it off. Ramingstein did not recover until the late 19th century; since then - and especially after WWII - the town is doing better due to tourism. More recently, Ramingstein has taken up great endeavours to fight its structural problems. The village tried to establish itself as a centre for arts and culture in the Lungau. An ancient farmhouse was transformed into something like a theatre and offers space for up to 500 people. The old silver mines are now show mines (with limited opening hours, though) and some of the silver ore processing facilities were restored. Over-all, Ramingstein might be well-worth a visit if you tour the Lungau.